Download link is a quick bit.ly redirect to a dropbox download. Middleman used only to count downloads. Dropbox used for high speed, ad-free downloads. - Added a skip/killswitch for the title screen in case it overwhelms anyone's computer. - Fixed error when a ragdoll hit a pick-up-able item. - Lots of under the hood updates for multiplayer. In fact, the server's up now! At least for a little while. Take it for a spin! - Entirely rewrote ledge-grabbing feature. Works much more reliably now! - Introducing xygthop's new 24/7 server! - Support to choose between my server and xygthop3's (much more online) server! I really hope this goes well! Have fun! - Updated IP Addresses for the servers. - Added new bleeding edge version with the custom level importer! Edited by Chrscool8, 29 February 2016 - 06:19 AM. 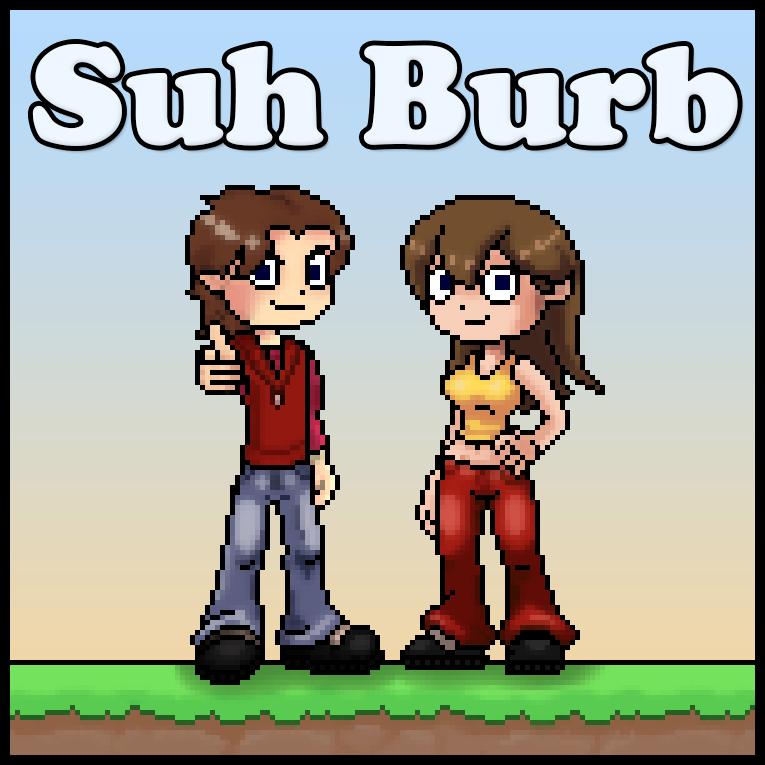 Click the banner to check out my game, Suh Burb! Add me on Steam! Let's talk about making games! This seems so incredibly amazing. downloading now! Wow, even dymanic foot placement? This is truly awesome! Edited by Pandaboy, 03 October 2013 - 05:31 AM. I didn't want to put too many features in the feature-list, so I left that one out, but just barely. I've been following this for a while! I have that old demo from the steam workshop still! I think this is simply amazing, you must have spent a great deal of time working on this! I love the smoothness of the animations, they are slightly comical yet realistic. The GMC, here lies she. Kicked to the curb, with nary a word. She shall live on, though. Remain strong, bros.
Hey, thanks, man! I really appreciate it! I've been working on the Suh Burb line for 5 years now, this iteration for... jeez, a long time now that I think about it. Really glad you like it. Doen't everyone just love it? The only problem is my computer goes SO SLOW when I'm playing it, unfortunate. This laptop is about five years old. Anywho, getting a new laptop with Win8 soon (I have Win7) so I'm alright lol. Would still like to know! Could you go to Control Panel\System and Security\System, then let me know what's in the System section, also the average "real fps" you have. Screenshot, perhaps? Please? Edited by IceMaster, 03 October 2013 - 07:13 AM. I managed to break the game though. Somehow there were 2 players. My clone was stuck in water with a skateboard and I was flying through the walls and also got teleported one time to random place. Sadly I was unable to reproduce that so no idea what caused it. This looks very nice so far. I especially like the character animations -- they're the real star of the show here. They look very natural and fluid, and there's quite a variety of different poses and animations for the different situations. Nice job on those. Beyond that, I can't say I really enjoyed the game. For starters, that intro was just interminably long and WAY too slow. It was almost as painful as your post. Finally, the options scrolled past (VERY slowly) and I tried to select one of them -- but somehow things got messed up and I couldn't select anything. So I quit/restarted. This time, I just hit ENTER and SPACE until something started. But once inside the game, it was very smooth and the FPS stay high. I'm not really a fan of platform type games where the challenge is mostly jumping / climbing / etc. But I can see this is very well made. Better than most similar games I've seen. Edited by chance, 03 October 2013 - 12:25 PM. Whaaaa. Sounds like you pressed S, then E, then I don't know what. Weird. Thanks, though! Thanks! Yep, that was something I didn't see often in games, so I was determined to see how it went! Pretty well, I suppose. Crap. Sorry about that. Yeah, the title screen is the most intensive part of the game. It runs at a scaled 1080p, with randomly generated mountainranges and shaders on top of that. I guess it was lagging out. I'll work on an alternate start up sequence. And heh, yeah... sorry about the post. The main parts are like, the first three sections, then the rest are just expected FAQs, really. Gave it a quick edit, since you pushed me off the fence about it. Sorry it wasn't to your taste. Thanks, anyways, though. I appreciate you taking the time to give it a shot! Minor update uploaded. Added a skip/killswitch to the title screen, in case it overwhelms any other computers. Edited by chrscool8, 03 October 2013 - 09:44 PM. It's beautiful. Smoothest GM platformer I've ever played, but I did kinda want doublejumping in there at times since jumps were at realistic height and I prefer the videogame feel. Menu looks absolutely stunning too. Ran into a bug halfway when running and jumping around, might want to take a look at that. Esports fan / SC2 masters protoss / LoL platinum ADC. One thing I'd like to mention is that hitting Esc just quits the game without any warning. I have a habit of hitting Esc in case I want to skip something, like talking dialog or cutscene... I understand that this isn't anywhere close to finished game but I suggest you change this ASAP if you are creating public releases. I didn't mind the game glitching out but the one thing that did annoy me was this single thing. I wanted to skip some dialog but instead the game just closed and I had to start all over again. Heh, yeah, you can actually double jump. I think it's just pretty hidden right now. See, there's a "Flair" system, but most of its gui elements and whatnot are hidden. If you do lots of tricks in a short time, flair mode activates. You become a double image and you can double jump. You can also just activate it by pressing * on the numpad. Oh, shoot. I know exactly what the problem is. It's never happened to me, but I get the logic behind it. The easiest way I can think of to cause that is to hit the medicine while a ragdoll. (Ragdolls are still a very new addition.) Is that what happened? Thank you for playing. I'm really happy that you liked it. I hear ya. Sorry about that! I almost always at least have an "Are you sure?" gate before killing it, but I guess I just never thought about it so far in this project. Next update, Esc will skip entire dialog sections. Good thinking. I've sat and watched your sig gifs for ages over various threads and thought they looked great, the finished thing is so much better though. As well as making and selling a game, I think you could possibly make money selling the engine too! I don't know if that's possible, I know we all write our own way and others looking at our code might find it confusing, but if it was doable, you could make a lot of money that way IMO. As for the game, I read you said you're not artist and to be honest, this game NEEDS the artwork to match the gameplay. It'd be a shame to have such a great engine, with so many features not being used to it's full potential. I'm sure someone would see this and would be willing to have a shared revenue deal or something if you can't afford to pay straight out, I know I would if I was any good at artwork. Possible the best use of GM I've seen tbh. GJ. Edited by MancVandaL, 03 October 2013 - 10:52 PM. Yeah, maybe! I'd say this engine is pretty well sorted actually. I took special effort to make sure all the parts were set up to be modular, so I could just fit in new features and abilities as I went with no trouble. I just mentioned elsewhere that I was even strongly considering a tutorial series once this is done. Just like my current dev playlist, but for each of those things a lesson. I totally agree. I would love to have an artist at my side for this. (Hear that artists? ) As confident as I feel about this game so far, the only thing I truly feel it lacks is that. That means a ton to me. Thank you so much. Edited by chrscool8, 03 October 2013 - 11:04 PM. "The easiest way I can think of to cause that is to hit the medicine while a ragdoll. (Ragdolls are still a very new addition.) Is that what happened?" Yep, pretty sure that was it. Nice to see you're already on it. Haha, yep. I know this engine inside and out by now. Already fixed it. Yeah. Any way of putting up the FPS? The menu's is SOOOO SLOOOOOWWWW. And also I want to play the game in a higher FPS. Oh man this is great! And is the mouse supposed to be visible on the menu? Cause otherwise how do you navigate the menu? Crap. Sorry about that. Yeah, the title screen is the most intensive part of the game. It runs at a scaled 1080p, with randomly generated mountainranges and shaders on top of that. I guess it was lagging out. Normally arrow keys and enter. I guess the title screen is too much for some people. I'd be surprised if the main game has slowdowns at all though. Oh man this is awesome! Doing flips is super cool! Also, what is the music in rm_dungeon_field and rm_lair? I recognize it, but can't remember the name. Edited by Robinskie, 04 October 2013 - 03:16 PM. Thanks! That's Bramble Blast from Brawl, which is a remix of Stickerbrush Symphony of Donkey Kong Country 2. Sorry, phones still double post.. I'll use this space for an update later. Edited by chrscool8, 04 October 2013 - 05:56 PM. this game rocks! is the online mode working? Edited by Nahuel3d, 05 October 2013 - 06:14 AM. Hmm I found an semi-impactful bug, that could pose a problem if it keeps occuring in every spot like this. 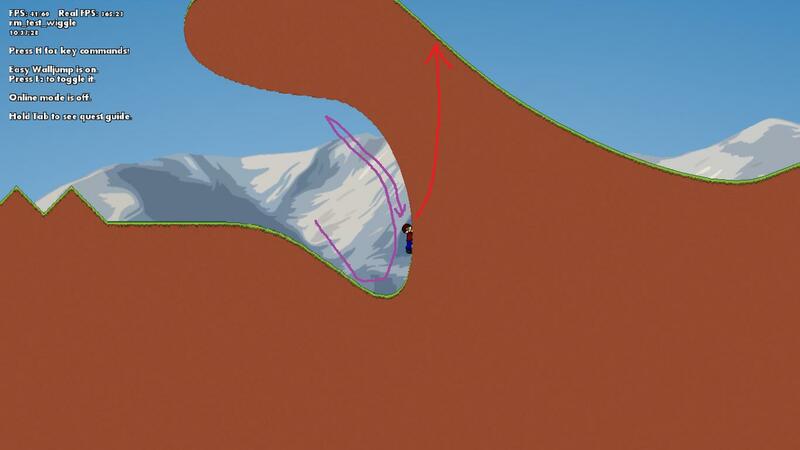 Purple path is how you can recreate it, and red path shows that you go straight up through the wall if you try to climb. Thanks! Haha, it'll be up soon. Just made a lot of enhancements for it (like player fighting and ragdoll syncing), but it has an issue where if it doesn't find the server, GameMaker freezes for 20 seconds. And that happens at the beginning of every room. (If it's up, it's instant.) Trying to find a better way around that. It's a GM thing, not a me thing. Crap. Alright. Thanks for bringing that to my attention! Ledge grabbing was never really polished. I'll work on it some more. I know how to fix that one, though. - Lots of under the hood changes to online mode. - Also, the server is online right now for a few hours until I edit this message! Edited by chrscool8, 06 October 2013 - 04:36 AM. great! for sure this game will be very popular, so keep up the good work! Edited by Nahuel3d, 07 October 2013 - 06:35 PM. it happened when my character jumped with its foot right into one of the gaps that you can trip over. I was still in mid-air. Edited by 2Create, 07 October 2013 - 09:12 PM. This forum is archived. The above content may not reflect my opinion any longer. Thanks! You know, I went back and tried to recreate that grabbing bug you specified there like 100 times and couldn't. I believe it, though, since it works weird sometimes in other places. On my list of things to fix. And yep. That's basically why I chose to put it out now. It had almost all the core engine features, so now I can polish it up a bit with bug reports from you all. And also, yep. GameMaker freezes for 20 seconds while looking for a connection, if one is not found. Trying to figure that out one. Huh. That should never happen. The only object that accesses that variable is the player object, and it's set at Create. Did it happen more than once? You sure they didn't just get pushed behind something? Also, the server is online as long as this message is! Make sure you're updated and come on in! Edited by chrscool8, 08 October 2013 - 07:12 AM. :D I sure hope that's a joke! ALSO, I NOTICED A BIG PROBLEM WITH TEXTBOXES, THEY SKIP CHUNKS OF TEXT. WILL FIX ASAP. Fixed! Whew. Had a mini heart attack. I just had two textbox objects in the room by accident so the key was being registered twice. That's a huge relief. Edited by chrscool8, 08 October 2013 - 02:17 AM. This game is one of the better platform games I have seen, made with game maker. and it doesn't have a plot yet it is just an engine. the graphics could be better, but they are not bad. but you definitely get props for the dynamic foot placement. that is awesome. And it was nice playing with you for a few minutes. 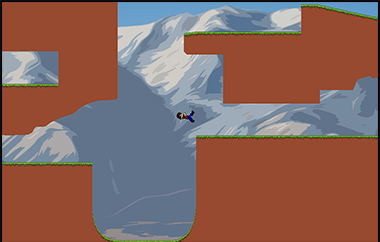 I had some trouble navigating some of the terrain, like when the floor is spiky the character struggles to get over the spikes if you get stuck standing in the middle of them. I also felt annoyed when there where sections I couldn't get past because they seemed impossible to get past. I could see this being like elastomania where you have set puzzles and levels to get through, but on foot there aren't as many tricks however I saw you planned to add skateboards and other such things which could make up for that. I personally couldn't get a skateboard to show up in the game so I dunno. Maybe adding flying fox cables would be awesome. Edited by Azaroth, 08 October 2013 - 04:09 AM. That's intentional! In the test stage, I put a lot of strange terrain to test every aspect of the engine. Yeah, totally. To get the skateboard, you turn debug mode on (F12), then "S". It's super unfinished at the moment, but it's there! Absolutely! That's been in the plans for a long time! Should come around soon! I'll try to reproduce the bug while having my screen capturer turned on. Maybe that'll tell you more. I even managed to get under the level (not on video) this way, only to pop skyward when I came out on the other side. Edited by 2Create, 08 October 2013 - 09:39 AM. That's some amazing tech you have there, awesome work! Aware, ragdolls are still new! Good catch, though. Yep, understandable. The bouncing off floor mechanism is only for debugging. You'll fall off and respawn soon. Yeah... It's weird with skinny parts. Happens on that one tiny tiny platform in the field level and on the skinny piece in a part of the angel island level. Will fix soon hopefully. I have to say, the collision checking alone makes me jealous, not to mention the other cool things. The background and foreground styles doesn't really match, though. You seem a lot better with Photoshop than with pixel art tools. Fix the download link please. BTW on my laptop the FPS doesn't go over 20. Never went down. It's Dropbox. And that's too bad. That the same specs you told me before? Also, make sure it's on High Performance and not Power Saver mode. Helps a ton. Edited by IceMaster, 11 October 2013 - 09:43 AM.